It was so cold this morning! It’s been a long time since I put on both my puffy and my rain jacket as I got ready in the morning, but today was one of those days. Even more unusual for me, I spent a good chunk of my morning wearing my beanie and rain jacket for additional warmth as I hiked through the tree cover. The morning started with a heavy mist that shrouded the trees before the fog finally lifted. I crossed my fingers that we’d be in for a beautiful day. So this is where Goat Rocks Wilderness is! The trail was relatively flat this morning, with a couple sub-thousand foot climbs thrown in for good measure. The big treat for the morning was the second climb, which finally had breaks in the tree line and good visibility. What a view! At first just if the surrounding mountains and ridge lines, bit then Mt. Adams started to gradually appear as I climbed higher. Finally we got to see it in all its glory! Just to add to the visual treat, the bushes surrounding the trail were full of berries, so between stopping to soak in the views and stopping to pick the berries there were lots of excuses to stop during the climb! We also ran into a couple of nobos that we’d seen a bunch in Oregon (including Twix), except this time they were heading south due to logistics. Given that we’ll be heading back to Oregon soon for the eclipse, it might have made sense for us to do the same… but I really wanted to keep up my nobo status so northward we hike! After lunch, the day continued to get more and more spectacular. We passed over a knob and BAM! The views were breathtaking. So this is the Washington that people talk about. Everywhere we turned, the views seemed to get better and better. This section of the trail was popular with weekend backpackers (deservedly so) and we noticed that prime camping spots were occupied as early as noon! Unfortunately (or fortunately? ), we had to keep moving. I stopped to chat for a bit with a ranger. She didn’t check my PCT permit (hasn’t been checked yet! ), but did remind us that we still needed to fill out the self-registration permits as we enter each park in Washington since they are used for search and rescue purposes. Our big goal for the afternoon was to make it over the Knife’s Edge and to a lower camp site before dark. 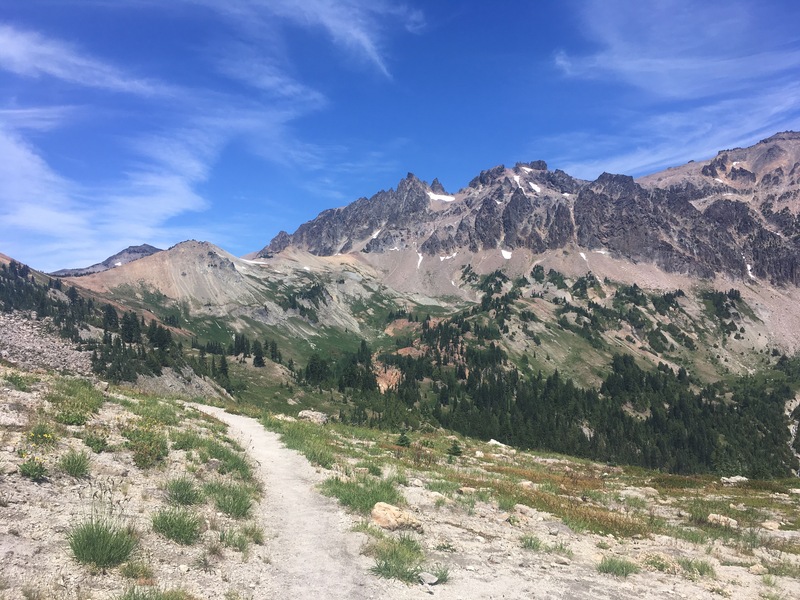 I’ve read about the Knife’s Edge in other PCT blogs, but was a little uncertain as to where it was in Washington (for some reason I thought that it was further north). It was only last night that I realized that we’d be hitting that section today! Luckily, the skies were clear as we approached the turn off for the alternate section of trail. But first, some snow! I can’t even begin to imagine how much work went into building this retaining wall. My understanding is that the alternate trail for the Knife’s Edge is basically the old PCT, but that it’s not equestrian friendly (it’s not). The funny thing was that by taking the alternate, we actually avoided having to traverse a large section of snow. 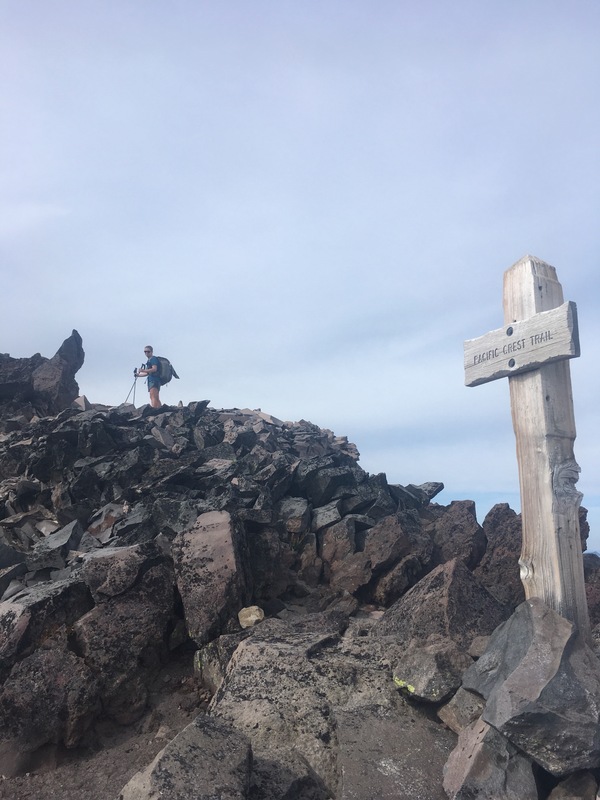 The trail initially climbed up on a rocky set of switchbacks, and then we descended along the Knife’s Edge itself — a section of trail set precariously atop the rocky ridge line. I’m not particularly scared of heights, but the rocky trail and steep drop off definitely slowed me down. The views were amazing though! As we (slowly) descended, the clouds started to move in and we soon found ourselves completely enveloped in the fog. It was an amazing sight… at first. Umm… where did my views go? The spectacular quickly turned to the somewhat scary. The visibility dropped and the wind picked up. I was soon cold (even with my rain jacket on) and battling the wind to stay on the steep, rocky trail. My goal quickly became to get to a lower elevation as soon as possible. The problem was, that with the steep trail (that kept going up instead of down) and uncertain footing, the descent did not go as quickly as I would have liked. I’m really glad that we didn’t hit the Knife’s Edge any later in the day (we hit the alternate turnoff at 4:15) because it ended up taking much longer to descend than I had anticipated. I can’t even imagine how miserable (and potentially dangerous) this section would have been in yesterday’s storm. The sobos that we spoke with this morning reported having extreme difficultly even finding the trail along this section. One young woman said that she’d had to set up her tent to wait out to storm because she’d gotten too cold and couldn’t find the trail (I have no idea where this could have been since we saw few places that a tent could have been set up)! After crossing a knob and getting to a lower elevation, we found that it was actually a lovely evening if you weren’t stuck in a bunch of clouds. Nonetheless, even though it was after 6:30 we passed the first potential camping area in favor of getting down even further. We finally settled on camping near Lake Lutz, which I’d expected to already be full of campers by the time we arrived given that it’s a water source. However, the first camp spot I found was vacant, so I called it a win and grabbed it. I can’t tell if anyone else is camped on the other side of the lake, but it’s pretty quiet and bug-free enough to eat dinner outside the tent! Somehow I didn’t manage to get any pictures of the lake (more of a pond…). Despite a somewhat sketchy and miserable end to the day, I have to say that today was one of my favorite days on the trail. The scenery was magnificent! 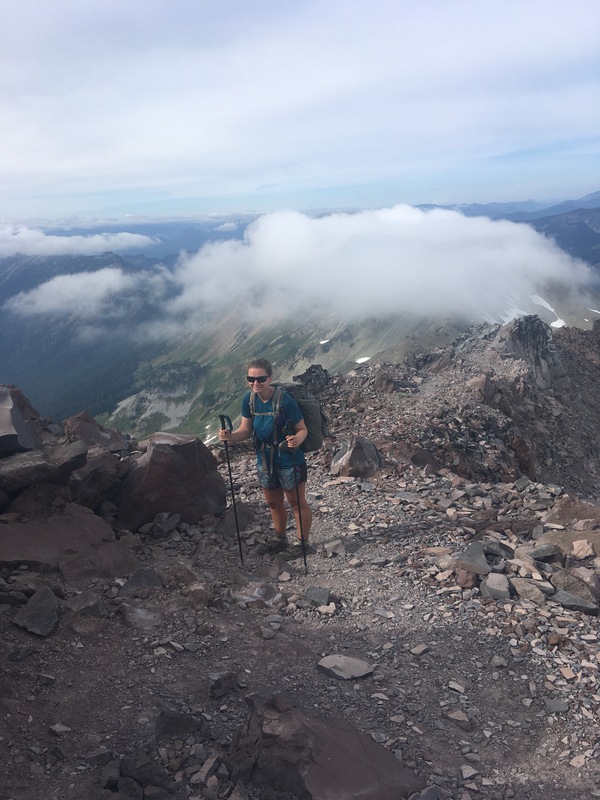 The reputation of Goat Rocks Wilderness and the Knife’s Edge is well deserved!